It is said, that to write well, you must read well. So, whether to improve your writing or for the pure enjoyment of a great tale, well-told, place Billy O’Callaghan’s, The Dead House, at the top of your list. It was while scrolling through www.writing.ie recently that I came across an article about his debut novel that piqued my interest, the title alone creating goose bumps. It was apparent that, at the very least, I’d read a story written by a master short story writer who has honed his craft. He has close to a hundred stories published in literary journals and magazines around the world while still others have won awards including the 2013 Bord Gais Energy Irish Book Award for Short Story of the Year. That’s no mean feat! So I went in search of The Dead House, published in early May, and on my third attempt managed to secure a copy. It all helped to heighten my anticipation. But finding this beautifully bound novel with its haunting image on any book shelf, I would have been instantly drawn to it. I felt as I had as a child when I came across a book I hadn’t read by one of my favourite authors and settled down to read, with a fervent hope that I wouldn’t be disappointed. I wasn’t. You can read the full review over on writing.ie by clicking here. 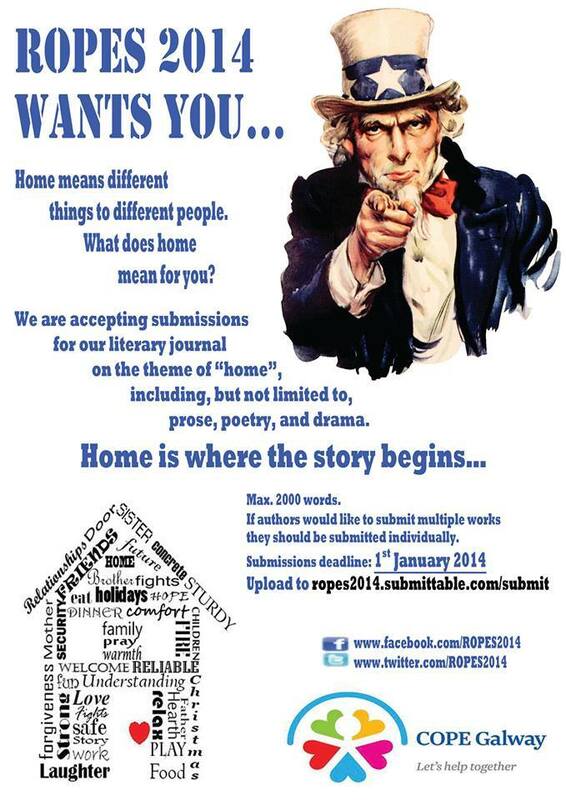 At this time of year, why not promote your writing – poem, short story or drama – on the theme of “Home” by submitting it to the literary journal Ropes 2014 while at the same time helping a worthy cause. I was delighted to receive an email from my (second!) cousin, Niamh Callaghan, who is involved with Ropes 2014, published by the students of the MA in Literature and Publishing at NUIG and now in its 22nd year. She has asked me to help promote it and I would be obliged if you could help me to do the same. Each year ROPES donates all of its proceeds to a worthy charity. This year they have teamed up with COPE Galway; a charity in Galway that tries to help people with issues such as homelessness and domestic abuse. So, if you happen to have a piece looking for a home or an idea floating around your head, maybe Ropes 2014 is just the place to submit! For more information check out Ropes 2014 on Twitter and Facebook for loads of updates and special announcements! Deadline: 1 January 2014 – upload to Ropes 2014 here.